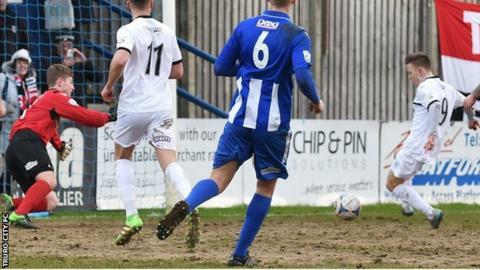 Truro City manager Steve Tully has urged his players to "keep reaching for the stars" after their 3-0 National League South win at Bishop's Stortford. Goals from Isaac Vassell, Ryan Brett and Matt Jay earned them the points and put them back in the play-offs. "The lads put in a shift and we're delighted to come away with three points," Tully told BBC Radio Cornwall. "It was a good professional performance - I thought the lads put in effort and we fully deserved the result." The victory lifted Truro back into the final play-off place ahead of the visit of Weston-super-Mare on Tuesday. The White Tigers have only lost one league game since the end of August, when they were thrashed 6-0 by Oxford City. "We'll keep going from game to game and wherever we end up that's where we're meant to end, so we'll keep reaching for the stars and see where we end up," added Tully. "The players want to finish as high as we can and if we're up there we're there to be shot at." Meanwhile, the National League has now approved Truro City's ground-share with Devon side Torquay United for next season.